Remember the T-Mobile dance in Liverpool St Station? The flash mob stunt will be followed up this week, 6 pm to 7 pm on Thursday April 30, with a Sing-a-long at Trafalgar Square. Here’s the four minute version of “Hey Jude”, by the Beatles, sung by a crowd of 13,500 with 2000 microphones, including American rock star Pink. How did they get 13,500 people? 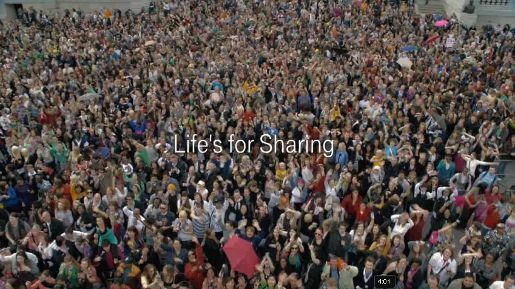 The power of Twitter, Facebook, signs in the street, and this video clip inviting the public to be there in the square. The Trafalgar Square event was attended by 13,500 Londoners, ready to join in the T-Mobile Karaoke session hosted by Vernon Kaye. Songs included ‘Summer Nights’ from Grease and ‘Total Eclipse Of The Heart’ by Bonnie Tyler, Britney Spears’ “Hit Me Baby One More Time”, The Foundations’ “Build Me Up Buttercup”, Erma Franklin’s “Piece of My Heart”, “Is This the Way to Amarillo” by Neil Sedaka, and “Hey Jude” by the Beatles. Surprise guest star Pink sang her hit, “So What”, from the middle of the crowd. Appropriate, of course, for the pink-branded T-Mobile. The new advert will be filmed and edited in just over 48 hours and premieres during the break of Britain’s Got Talent on Saturday May 2 at 9pm on ITV1. See Nick Burcher’s take on the event. Crowd responses filmed by the Partizan crew indicate that the Sing In raised community spirit among those there. The Trafalgar Square stunt was developed at Saatchi & Saatchi, London and Partizan Films.